Disclosure: Some links in this blog post are affiliate links, meaning, at no extra cost to you, I may make a small commision if you choose to make a purchase through my link. This is how I can continue to bring you free advice and anxiety tips. Thank you for supporting the BN1 Blog! Being a total newbie to essential oils, I figured out that I needed to get a diffuser or make a kind of balm or mist spray concoction... The first option sounded a lot easier and after much deliberation, I decided to get a diffuser necklace so I could feel the benefits of Lavender Essential Oil wherever I went. 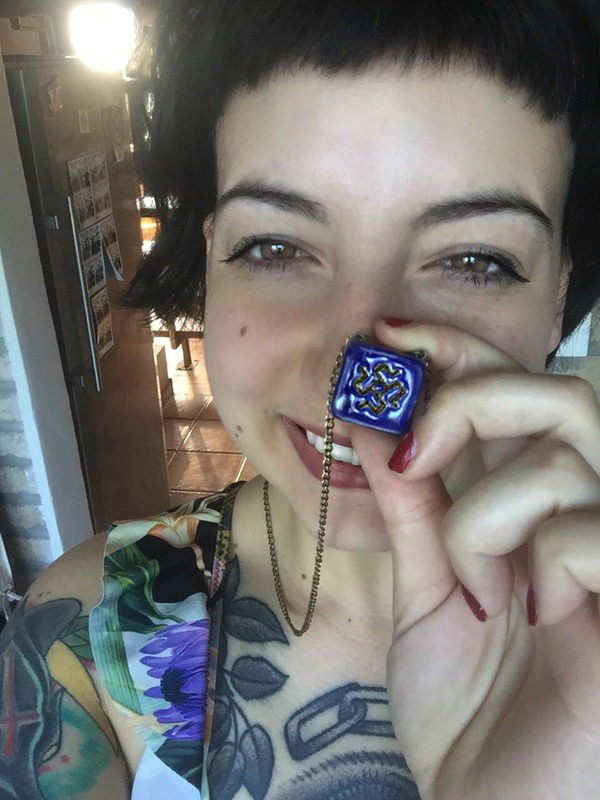 I don't know if this is the same for you, but I tend to be less anxious at home and more anxiety-riddled at work or out-and-about so it was important for me to use something portable - and who can say no to a new piece of gorgeous jewelry? It's going to help my anxiety, right? So, I browsed Etsy and came across loads of gorgeous diffuser necklaces, but because I now live in Lithuania I wanted to get something made locally. I ended up choosing an Ethno Baltic themed piece made from blue clay with an ancient pagan symbol carved into it - the Magic Kite Talisman. It symbolizes renewal, the passage of time, opening up to new experiences, and change. This piece is a one-off but you can browse the Etsy store where I bought it, EtnoCraftsLT, to find similar styles - or browse Etsy to find something else you like. The diffuser necklace is so simple to use - the clay design is filled with wool and through the hole in the back, you just place a few drops of Essential Oil onto the wool. The scent then diffuses through the holes in the necklace (they don't leak, so don't worry!) and you get to smell delicious Lavender all day. 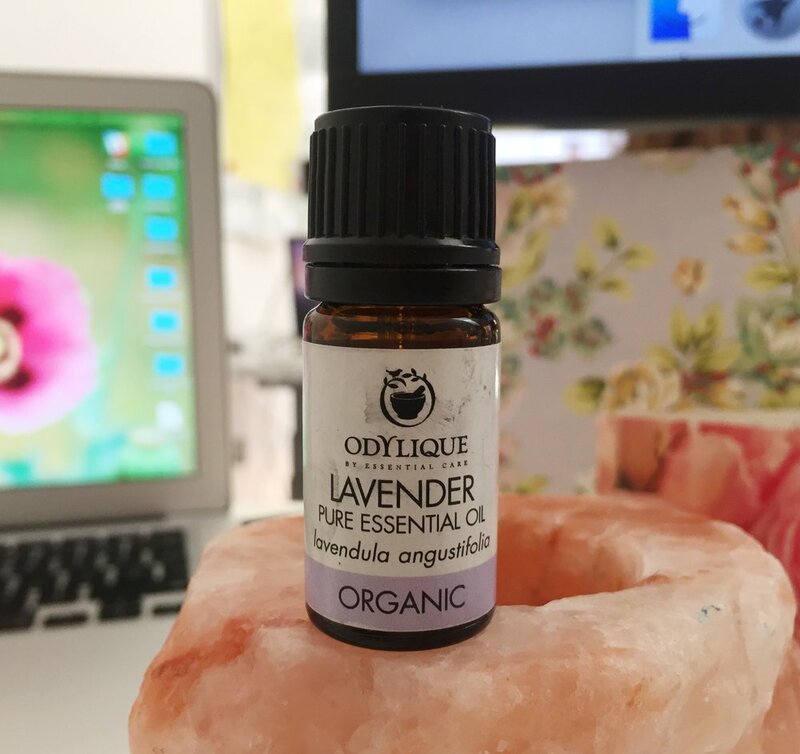 I picked up a bottle of Lavender Essential Oil from my local health food store (that's Livinn' if you're local) for 7.99 euro by a brand called OdyLique - but you can order from a supplier near you on Etsy if you'd like. I'd recommend getting an organic blend as you'll feel greater benefits if you use a better quality oil. This is my trusty Lavender Essential Oil! She's all dirty because I take her everywhere. I sleep better at night. I know this is a big deal for a lot of you anxious babes, as restless nights are the worst! But, using this oil, I've found that I don't get lost down a path of frantic thoughts. Instead, I've just been enjoying breathing in the scent and quickly falling asleep. I didn't wear the necklace to bed, instead, I put a few drops of oil into the edge of my pillow and it works incredibly well. I feel super chilled. There's something about this smell that I just really enjoy, and I've been far less anxious than usual. Anytime I've needed to calm down or noticed my anxiety creep up, I've simply lifted my necklace up to my nose and taken a few deep breaths. This small practice is helping me to be more mindful of my thoughts and I literally feel like I have a little safety net around my neck. It's working as a great preventative for slipping down an anxious hole. Overall, I'd really recommend trying Lavender Essential Oil as a natural anxiety treatment. In such a short time, I've already seen great benefits in terms of anxiety reduction as well as a bonus: peaceful sleep! If you love the design of my diffuser necklace, please show EtnoCraftsLT some love! I'd love to know if you're going to try this oil, or maybe you already use it? Please leave your story in the comments!